This selection of restaurants in Puerto Rico's capital represents the best of the best—whether an affordable, rustic neighborhood eatery or a posh culinary superstar. Most Puerto Ricans, from blue-collar workers to senators to celebrities, would agree on this: when you want true, old-fashioned, home-cooked Puerto Rican food, you just can't beat La Casita Blanca. Set in a quiet corner of Santurce, this place is a no-frills local eatery where you can find terrific local staples. The best day to go is Sunday when heaping cauldrons of the food Puerto Ricans love are lined up for a gut-busting feast. In San Juan, this is certainly one of the most authentic representations of what pure Puerto Rican cooking is all about. Priding themselves on creative dishes using sustainable foods, Marmalade is not about following the latest cooking trends. Instead, Chef Peter Schintler brings nutritionally inspired ingredients to the table in a unique and complex way that will indulge all of your senses. There is an a la carte menu, but perhaps the best way to enjoy Marmalade is by selecting one of the tasting menus—four, five, or six courses—so you can explore the variety of the island's organic produce and local foods in imaginative combinations, while enjoying those comforting flavors we all love. And the elegant vegetarian menu may just turn you into one for the night. Enjoy ocean-front dining in the heart of San Juan at this trendy Condado restaurant. The sleek, modern "mansion" sets the stage for a one-of-a-kind experience—and the food doesn't disappoint! The seafood-heavy menu (although there are plenty of meat entrees to choose from) is influenced by tropical flavors and features creative dishes to satisfy any discerning palate. Start the evening with one of Oceano's signature drinks, then savor the talents of Chef Ann Marie Antonetti as you take in the ocean breeze. 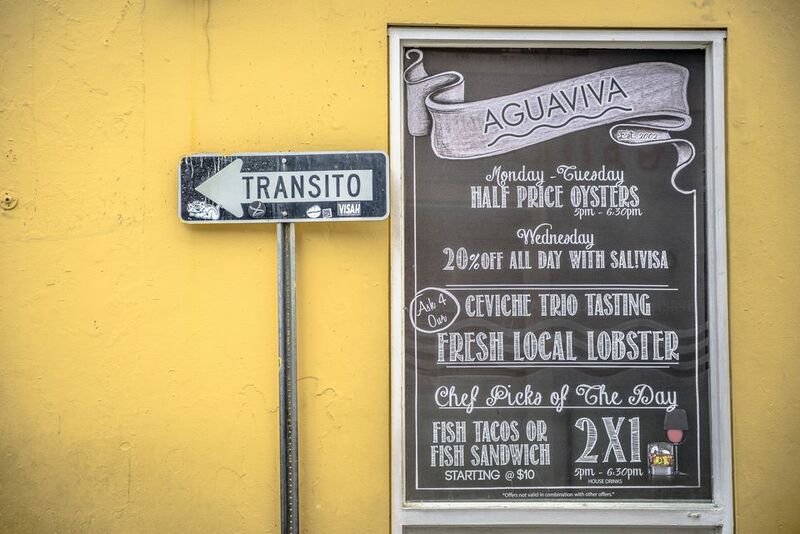 Aguaviva's creative Puerto Rican takes on a variety of ceviches offer a refreshing seafood alternative to the typically artery-clogging fare you'll find on the island. The restaurant also has an excellent raw bar, a variety of creative dishes and, for those of you who love fried food, a to-die-for calamari sandwich. Throw in the watermelon sangria and the scrumptious cheese-drizzled fried oysters and Aguaviva will win a special place in your heart and your stomach. Set in a historic building, Santaella is a restaurant serving authentic Puerto Rico recipes utilizing local ingredients—so local, they are from the farmers market next door. Chef Jose Santaella turned his catering business into a dining destination using his 20 plus years of experience to marry the island's tropical flavors with San Juan's rustic heritage and current trends in cuisine. Select from a vast cocktail menu, then try favorites such as the goat cheese quesadilla and braised pork shank and finish the meal with a quesito, a Puerto Rican cheese-filled pastry. This beloved New York City fixture has made its way to San Juan—and has been welcomed with open arms and rave reviews. Set in La Concha Resort and Hotel, Sarafina brings the flavors of Italy to Condado beach. Enjoy traditional specialties such as crostini di sofia (toasted bread with mozzarella and prosciutto), tagliolini di Portofino (pasta with pesto, string beans, pine nuts, and potatoes) and chicken Milanese (crispy organic chicken with mixed greens and tomatoes). An expansive pizza menu is also available. Located in the Condado Vanderbilt Hotel, this elegant restaurant has been described as an "experience" and not just a meal. Michelin-star-rated Chef Juan Jose Cuevas shares his culinary expertise by crafting locally sourced ingredients into exquisite dishes that are fresh and contemporary, exploring new boundaries of flavors. Choose from the a la carte menu, three-course prix fix, or the farm-to-table experience menu as you take in the extraordinary ocean view. The evolving menu at this eclectic restaurant is inspired by different cultures' cuisines and innovative techniques in the culinary world. Through the open kitchen, you can watch the chefs creating the visually appealing dishes that also please the taste buds. The courses are broken down by "acts"—the first act through the fourth act—plus a variety of vegetarian options and side dishes. From butternut squash flan to squid ink Fideua with prawns to double-cut lamb chops, you may have trouble deciding. The climate and ingredients of Puerto Rico are what inspires and directs Chef Jose Enrique when developing the dishes for his restaurant. One year after opening, Jose Enrique was voted one of the best new restaurants and has continued to gain praise since. Upon sitting, your waiter will hand you a handwritten sign of what the chef is cooking that night—talk about fresh!